Fresh strawberry cake filled with strawberry-lemon jam and topped with a fresh strawberry cream cheese frosting—this is a special occasion show-stopper and it’s divine! 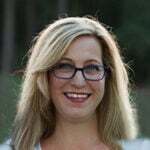 Part of the genesis of In a Southern Kitchen was a desire to share recipes and ideas that would help folks entertain at home. 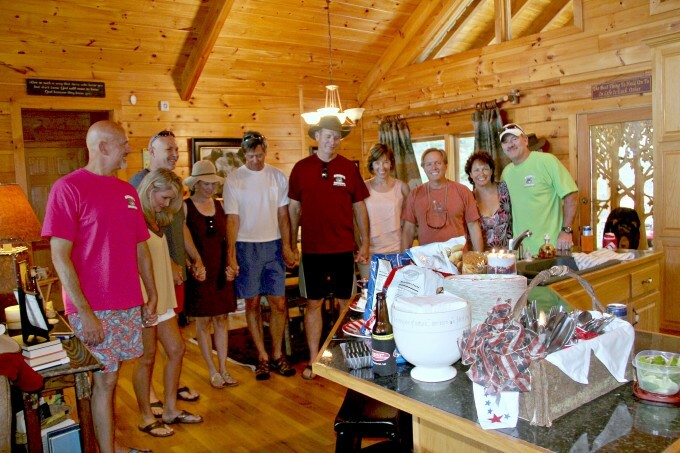 Tolkien said, “If more of us valued food and cheer above hoarded gold, it would be a much merrier world.” Around here, we call it doing life together and we do a lot of it! If there’s a birthday, we celebrate with lunches or dinner out, and if it’s a decade birthday then there’s always a big party. Family celebrations are usually in multiple bunches as well since everyone has in-laws and different family gatherings to attend. And as our family continues to grow, just having those times together becomes more and more precious. 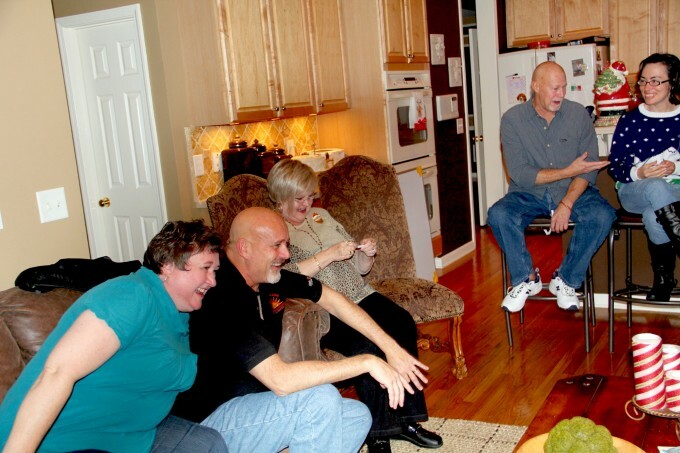 It is in these moments—when friends and family gather around a table, holding hands, blessing food, drinking wine, laughing, crying, reminiscing—that one feels enveloped by boundless grace…and it is in these moments that life unfolds. Cherish them. 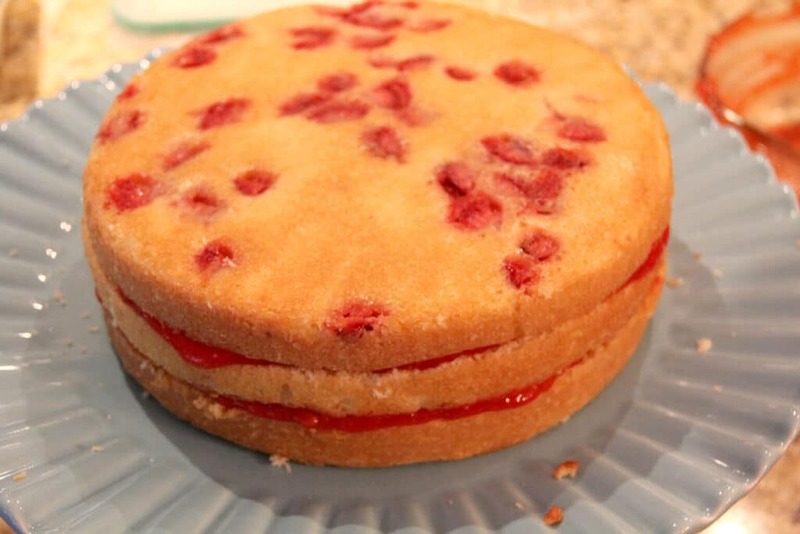 Notes: Please read through the entire Fresh Strawberry Cake recipe before beginning. It’s a good idea to have cake dowels or something with which to help hold the cake together. I’ve used cut drinking straws before. 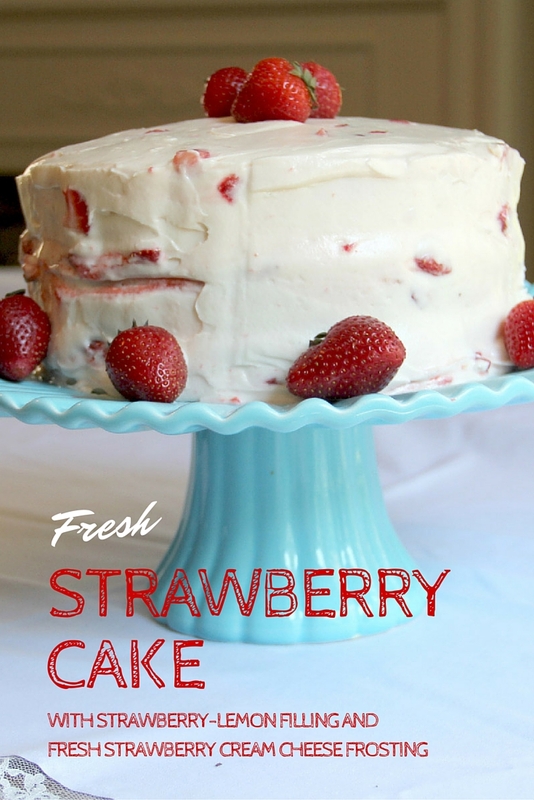 This fresh strawberry cake is an amalgamation of several different recipes. 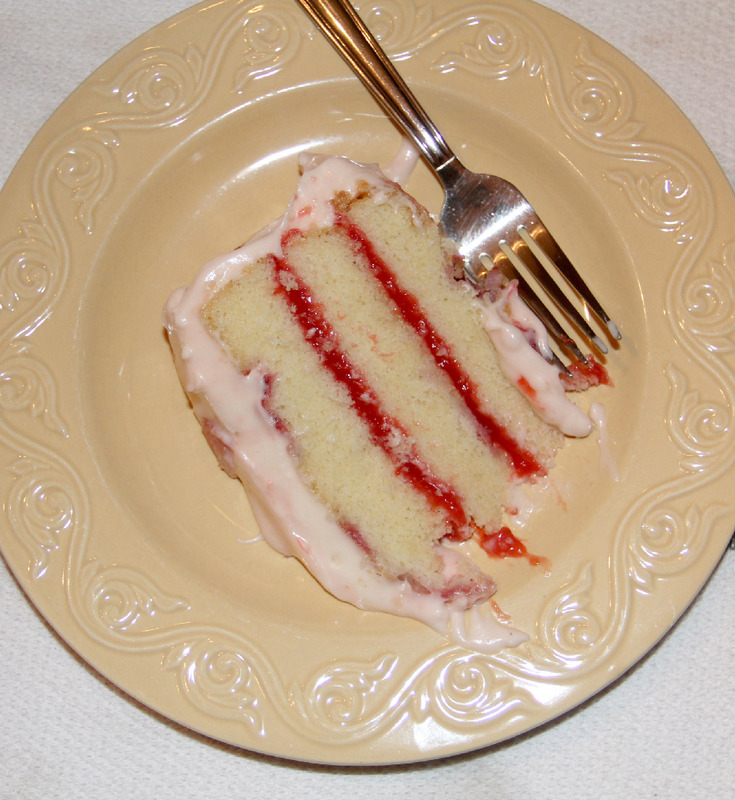 I’ve doubled Shirley Corriher’s moist golden cake recipe and added chopped fresh strawberries to the batter. The strawberry-lemon filling comes from a Southern Living recipe. This may be my favorite part of the cake—it’s sweet and tart and helps keep the cake moist while adding a wonderful flavor. 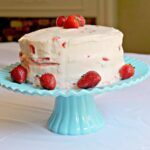 The strawberry cream cheese frosting is just a standard cream cheese frosting, with the addition of shortening to give it a little more heft along with fresh strawberries. This is also my favorite part of the cake! I love cream cheese frosting, especially with strawberries added to it. 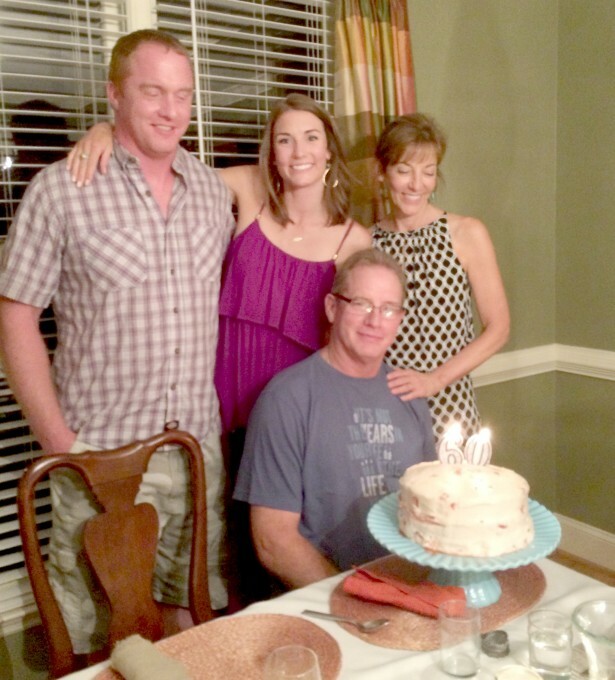 The entire cake was inspired by the Fresh Strawberry Cake at Gabriel’s in Marietta. 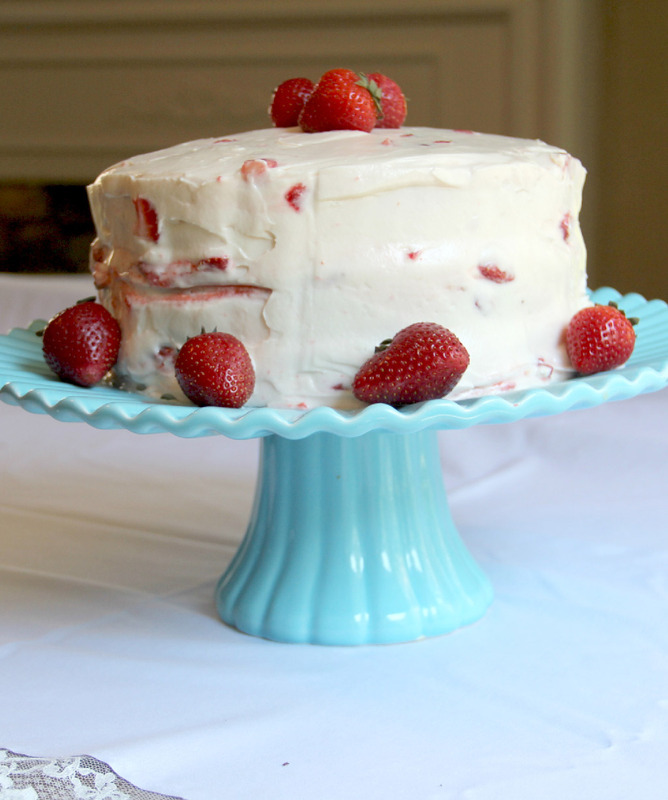 This Fresh Strawberry Cake is time-consuming and a lot of work. But if you want to share something special with someone you love, this cake is the one! 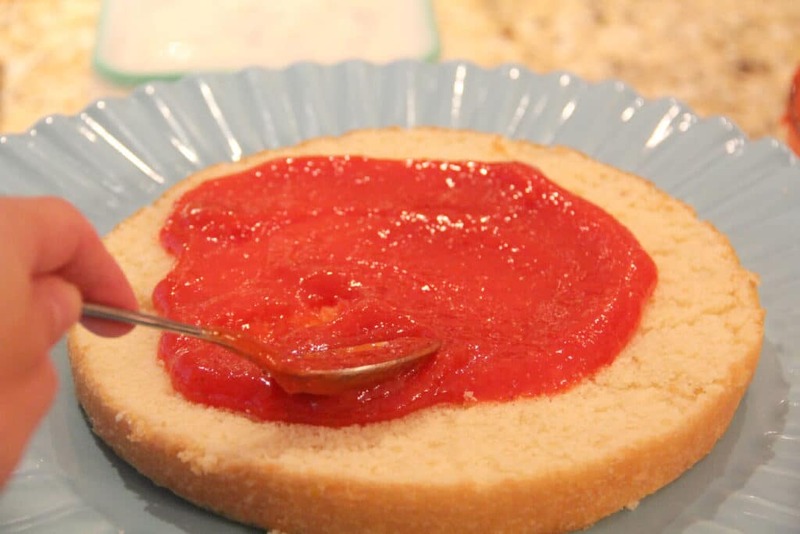 This recipe has been included in the Easter Recipe round-up on Southern Bite. A moist yellow cake infused with fresh strawberries, filled with a strawberry-lemon jam, and covered with a strawberry cream cheese frosting. Puree strawberries in a blender until smooth. 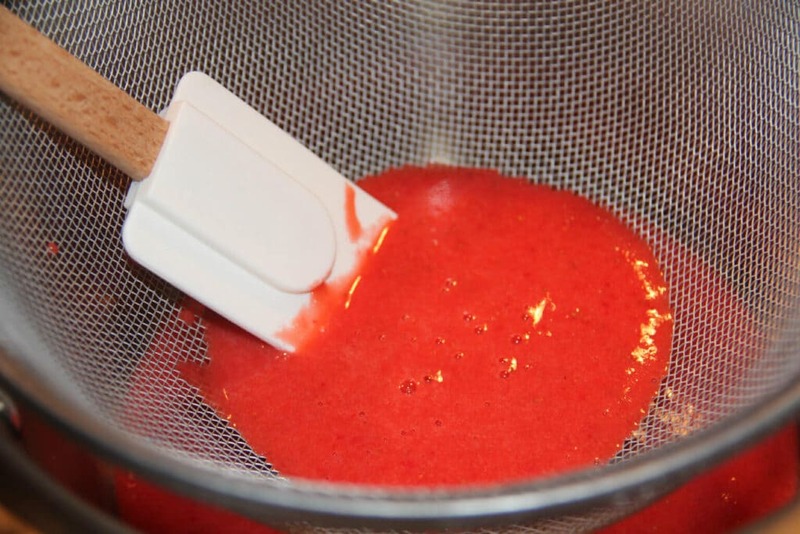 Press through a wire mesh strainer into a large saucepan and discard any pulp. Stir in sugar. Whisk cornstarch and lemon juice together and gently whisk into strawberries. Bring to a boil over medium-heat and cook, stirring constantly for one minute. Remove from heat and allow to rest about ten minutes. Pour into bowl and press plastic wrap directly on top of filling. Chill until no longer warm. Filling can be made up to one week ahead. Butter and flour three 9-inch cake pans. You will also have enough leftover batter to make almost a dozen cupcakes so prepare a cupcake pan as well. Line the pans with parchment paper and lightly grease the parchment paper. Using stand mixer, beat flour and baking powder for 30 seconds at medium speed. Transfer flour to a large bowl and set aside. Add sugar to the mixing bowl. Heat water to a simmer and add to sugar. Beat to dissolve sugar. Beat in butter, vanilla, and salt. Add canola oil and beat on medium. Add about one-third of flour and blend on low. Add the remaining flour and mix until just blended. Stir in egg yolks one at a time by hand. Stir in eggs one at a time by hand. Remove bowl, beaters, and cream from freezer. Whip cream just beyond soft peaks. Stir in 1/3 of whipped cream and then gently fold in the rest. Stir the tablespoon of flour into the chopped strawberries. 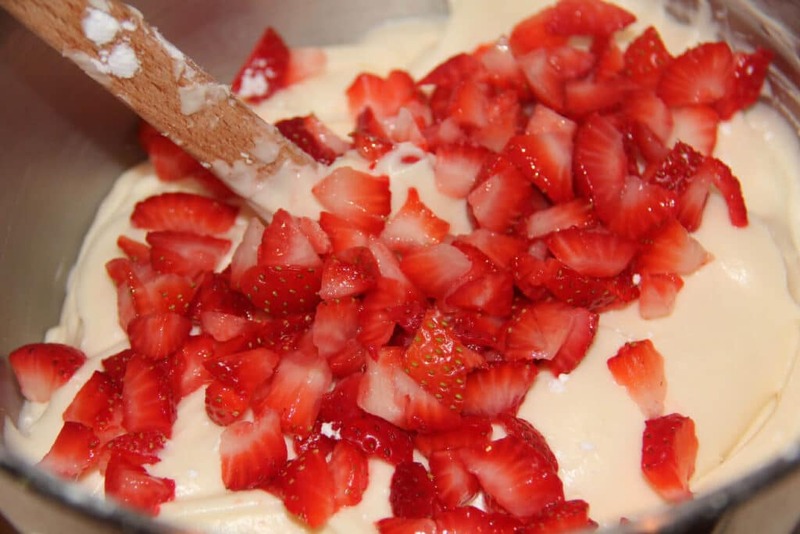 Gently stir the strawberries into the cake batter. Pour batter into the cake pans about halfway, no more than 2/3 of the pan. Pour remaining batter into prepared cupcake pans. Drop pans on counter from about 5 inches in the air to release air bubbles. Bake for 20-25 minutes, until cake springs back in the middle and toothpick comes out clean. Place parchment paper on wire racks. Cool cake in pans on wire rack for 10 minutes, then turn out onto parchment paper covered wire rack and cool completely. Cream butter, cream cheese, shortening, salt, and vanilla. Add lemon juice. Gradually add confectioner's sugar, starting with just 4 cups. You may add additional sugar in 1/2 cup increments until you get the taste and consistency that you want. I tend to like a stiffer frosting that's a little less sweet so I usually use about 6 cups. When frosting is the consistency you want, gently stir in the chopped strawberries. If you get the frosting too loose then stick it in the refrigerator for half an hour. Place bottom layer on cake plate. If your layers are mounded, use a long bread knife to cut off the mound and make them flat. Place second layer next and repeat with jam and frosting. Place third layer on top. I use dowels to hold the layers in place. If you don't have dowels, you can use drinking straws and cut them the height of the cake. It's a good idea to use something to hold them because the frosting and jam will make them slide. Finish frosting top and sides of cake and place cake in refrigerator until half an hour before serving. You should have plenty of frosting leftover for the cupcakes. Your cake looks delicious! And I love that blue cake stand you’ve got it on. So pretty!